This is an incomplete draft!!!! III. 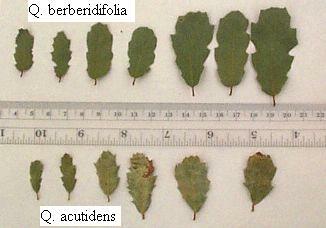 Observed Properties of Q. acutidens and "Q. berberidifolia"
IV. Distribution of Q. acutidens and "Q. berberidifolia"
Quercus berberidifolia is thought to be a widespread species in Southern California. This apparently is not the case. I have found specimens similar to Quercus berberidifolia only in the Santa Monica Mountains (WTR) in Southern California. Every other area I have examined in the South Coast (SCo) and Peninsular Ranges (PR) that was supposedly populated by Q. berberidifolia is instead populated by Q. acutidens (=Q. Xacutidens of some authors). In particular, I have yet to verify any Q. berberidifolia in Orange, Riverside, or San Diego Counties, despite sampling eight locations in those counties covering an area with a diameter of ~60 miles. Furthermore, I have been unable to find any pure stands of Q. acutidens, as delineated e.g., in Roberts (1995), where all the specimens have only the trichomes of that species. Every stand I have analyzed so far is consistent with having roughly equal numbers of specimens with only the trichomes of Q. acutidens as well as specimens that show additional variable numbers of the trichomes of Q. engelmannii. The percentage of Q. engelmannii is unrelated to the presence or absence of any nearby specimens of Q. engelmannii. Thus Q. acutidens is a stabilized introgressant species, produced long ago, probably by some ancestral scrub oak hybridizing with Q. engelmannii and eventually producing a new species. In particular, Q. acutidens is not an F1 hybrid between Q. cornelius-mulleri, or any other scrub oak species, and Q. engelmannii. This hypothesis is inconsistent with the observed local variation of Q. acutidens, and the fact that this local variation is uniform over large distances. In this view, specimens that show only non-Q. engelmannii trichomes are simply one extreme expression of this species. Specimens that additionally show trichomes of Q. engelmannii are just another expression of this species and do not reflect additional parentage by Q. engelmannii. This is supported by data presented here that it is often impossible to predict, based on the morphology of a given specimen, whether a given specimen will show any Q. engelmannii trichomes. Clearly, the genes for most physical characteristics contributed by the long-ago parents have become thoroughly mixed. The one stand of "Q. berberidifolia" that I have examined in the Santa Monica Mountains also seems to be a stabilized introgressant species, and is not the Q. berberidifolia of the literature. However, data from many other locations in the Santa Monica Mountains need to be collected and examined to understand if this feature is widespread. 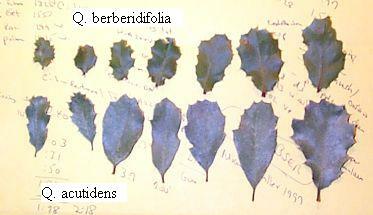 I present in detail the observed properties of Q. acutidens and "Q. berberidifolia". The density of the leaf trichomes is by far the best way to discriminate the two species. Leaf color may also be a fairly reliable discriminant. The species have different distributions of leaf and petiole length, but the overlap is large, making it difficult to use these as a discriminant for many specimens. 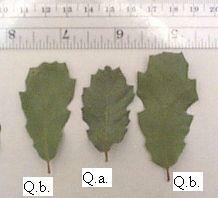 The primary discriminants in the Jepson Manual key between Q. acutidens and true Q. berberidifolia are the leaf shape and leaf margin properties. However, these two characteristics are essentially useless in discriminating Q. acutidens from the "Q. berberidifolia" population analyzed here, due to nearly complete overlap in these properties for these two species. This paper considers only the scrub oaks of the southern California Floristic Province, and hence excludes the scrub oaks found only in the desert areas. Scrub oaks are so typical of the Southern California chaparral that they were the source of the name for the chaparral. It is therefore all the more amazing that botanists have taken an extremely long time to come to grips with the different species that fall under that name. When you investigate, you find that the bushes are undeniably oaks, and you are happy in the acquisition of one more fact to add to your stock of chaparral knowledge. But later on you are in dismay, when you learn that there are several of these scrub-oaks, and that you are not able to tell them apart. If you are of a happy go-lucky sort of disposition, you will just class them all as scrub-oaks and let them go at that. But if you are painfully discriminative, the worry of uncertainty will probably be with you for many a day, for these various scrub-oaks are widely distributed in the Elfin-Forest, and you will be continually running across them. They form about 15 per cent of the cover. Quercus dumosa ... is not only the ... most widely distributed, and most plentiful wherever it is found, but is also the one which is most frequently shrub-like in form and appearance. The dumosa varies a great deal in size, and also in shape of leaf and acorn -- in fact, so much so that the botanists have tried to make several species out of it, but not with very much success. The successful delineation of species for our scrub oaks did not occur until 1981 through 1994. The existing floras for Southern California treated them all as Q. dumosa until the Jepson Manual came out in 1993. Hence many people trained before the mid-1990s continue to identify all our scrub oaks as Q. dumosa. Many botanists, especially amateur botanists who are already annoyed with the alarming frequency with which botanists change species names, even today would prefer to be people with a happy go-lucky sort of disposition and continue to call all of the Southern California scrub oaks Q. dumosa. There is nothing wrong with that approach, and if that is your preference, you should stop reading this paper now and continue to do so. However, there is no doubt that there indeed are a number of separate species which make up this population, and it turns out it is fairly easy to distinguish them, once you know how to do so. In 1995, Fred Roberts wrote a wonderful little book on The Oaks Of The Southern California Floristic Province. That book taught me how to distinguish the white oaks by teaching me about trichomes. Without that knowledge, none of the discoveries presented here would have been possible, and I would still have been thoroughly confused about the different scrub oaks. The rest of this paper is organized as follows. Section II reviews the scrub oak taxa and their historical treatment. Section III presents the properties of Q. berberidifolia and Q. acutidens, and how they are best distinguished. Section IV presents the distribution of these two species, from my fieldwork in late 2003 and 2004, and analysis of the results. Prior to ~1980, botanists attempted to differentiate the different species of scrub oaks primarily by use of leaves, which did not meet with much success. 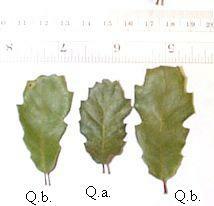 Nixon (2002) speculates that the failure was because leaf form is highly convergent for these scrub oaks. Around 1980, it was recognized that the hairs on the underneath of the leaves, the trichomes, were significantly and reliably different in many of these species. This transformed the field dramatically, and directly led to the clear recognition of many of these species. from southern Riverside County through interior San Diego County into northwestern Baja California, often forming extensive stands. Q. Xacutidens is the most abundant scrub oak in interior San Diego County, as in the vicinity of Ramona. The large maroon rectangle marks the location of Ramona. Because the actual width of its range is unspecified by Roberts, I simply plotted a line to the north-south endpoints of its distribution delineated by Roberts. Since Roberts has plotted Q. berberidifolia as distributed over that same area, he either considers their range to overlap in that area, or to share that range in a mosaic pattern. Bearly reaching our area in the vicinity of Tejon Pass; forming extensive stands farther north. Note that the labels or arrows only mark one of the ranges for each taxa to identify the color used for each taxa. All taxa other than Q. durata gabrielensis have multiple contours. I place the name Q. berberidifolia in quotes, since I present evidence here that a significant portion of the range given by Roberts for Q. berberidifolia is actually the range of Q. acutidens. 1842 Q. dumosa Every one of these separate taxa were considered to be Q. dumosa until ~1982, when it was recognized that this species was restricted to a small number of coastal areas as shown above, plus a short distance of the northern Baja California coast. 1854 Q. berberidifolia Even though this name was defined in 1854, few botanists accepted it being split from all the other scrub oaks until ~1982. This name was restored in ~1982, and then applied to all scrub oaks except the strictly defined Q. dumosa. 1858 Q. acutidens Although defined by Torrey in 1858, most botanists simply treated this as one of the many variations of Q. dumosa. 1981 Q. cornelius-mulleri The first species finally recognized to be different from all the other scrub oaks. 1982? Q. berberidifolia The restoration of this name, which was then applied to all scrub oaks except Q. cornelius-mulleri and Q. dumosa, was caused by the recognition of Q. dumosa as a separate species. Thus we now have eight taxa (seven species) of scrub oaks: Q. acutidens, Q. X alvordiana, Q. berberidifolia, Q. cornelius-mulleri, Q. durata var. durata, Q. durata var. gabrielensis, Q. john-tuckeri, Q. pacifica, all of them white oaks. Of these, Q. X alvordiana and Q. durata var. durata are not found south of the Tejon Pass, and Q. pacifica is restricted to the Channel Islands. Hence in mainland Southern California, there are only five taxa. Around 1980, it was recognized that the hairs on the underneath of the leaves, the trichomes, were significantly and reliably different in many of these species. This transformed the field dramatically, and has led to the clear recognition of many of these species. Easily-visible trichomes, 0.4 - 1.0 mm diameter clusters: Q. dumosa and Q. durata var. gabrielensis. Minute trichomes, 0.1 - 0.2 mm diameter clusters: Q. acutidens, Q. berberidifolia, Q. cornelius-mulleri, and Q. john-tuckeri. Thus no one who looked at the underside of the leaf would ever confuse Q. dumosa with Q. berberidifolia; they are as different as night and day. The rest of this analysis page considers only Q. acutidens, Q. berberidifolia, and Q. cornelius-mulleri, and their distribution in Southern California. I use the name Q. acutidens for this species, for two reasons. First, no one has ever crossed Q. cornelius-mulleri X Q. engelmannii to produce a plant that looks like Q. acutidens; the possible origin of this species is thus purely speculative. Second, this species is apparently the most widespread species in at least the SCo and PR provinces of Southern California. This species may very well have originated originally as a cross between those two parents, but it long ago became a stabilized species in its own right. Retaining the X in its name simply confuses most botanists into thinking it is a much more localized species than it actually is. As part of my trail plant guide work with Jane Strong, I have encountered numerous scrub oaks in the Peninsular Range (PR) and the South Coast (SCo). Amazingly, I didn't see a single specimen that keys out to Q. berberidifolia until I went to the Santa Monica Mountains! In the pictures below, the Q. berberidifolia all come from near Saddle Peak in the Santa Monica Mountains. The Q. acutidens come from various locations as specified in each set of pictures. Sometimes the camera captures much more dramatic color differences than the eye does, and sometimes the eye sees more of a difference. The color difference also depends strongly on the lighting and the viewing angle. The color of the paper that the first pictures were taken on is gold. The top picture above was taken from the right side of the leaves, looking down on them. You can see the size distortion caused by the perspectives that were not straight down on the leaves. 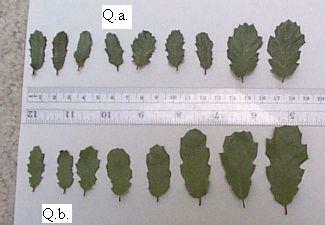 The actual size of the leaves ranges from 17 to 39 mm for the leaves in the top row, and 33 to 53 mm for the leaves in the bottom row. Overall, the q.b. leaves are clearly green, with no modifier for the color. The q.x.a. leaves could be described as gray-green, dark-green, or milky-green. However, note the similarity of the colors at times, even as seen by the camera, from different perspectives. In the top two pictures, the top portion of the two leftmost q.x.a. leaves is pretty similar to the q.b. leaves. In the middle left picture, the color of all the q.x.a. leaves is now closer, but clearly different, from the q.b. leaves. In the middle right picture, now the 3 or 4 leftmost q.x.a. leaves are closer to the q.b. leaves. Finally, in the bottommost picture, note how similar the leaves are. Note that even the portions of the leaves that were angled toward the camera, and hence reflected more light from the flash, are a similar green from each species. The rest of the leaves are gray-green for both species. Instead, all the scrub oaks inhabiting the range for Quercus Berberidifolia given in Roberts' Illustrated Guide to the Oaks of the Southern California Floristic Province appear to be Quercus acutidens. This newly-recognized widespread occurrence of Q. acutidens argues for calling it by that name, its original name given by Torrey, rather than the name of Q. Xacutidens as treated in the Jepson Manual. The hybrid nature of this taxon has only been speculation, and has never been proven by actual production of any plant by crossing the supposed parents.